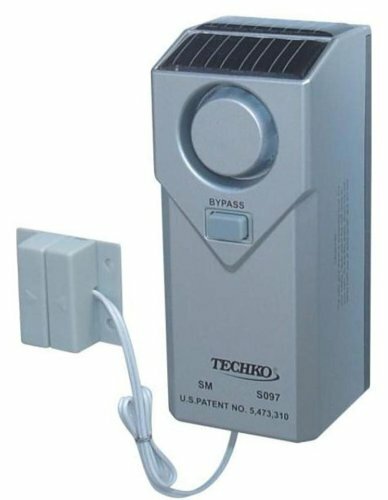 Techko's S183 Ultra Slim Safety Entry Alarm can provide valuable protection for your home or property by detecting the unauthorized opening of a door sliding window or cabinet door all in a low-profile design. This can be mounted on almost any door or window setup and requires no wiring or special installation. When the door or window is opened the alarm's switch detector sounds the built-in db alarm. After 60 seconds the alarm will reset itself. To arm or disarm the system there is a convenient slide switch on the side of the unit. Magnetic sensor entry alarm. High output 100-110 dB akarn. Built-in siren or chime mode. Alarm/Off/Chime slide switch operation. No wiring required. Ultra slim design. Low battery LED display. (3) 1.5V AAA Batteries (included). 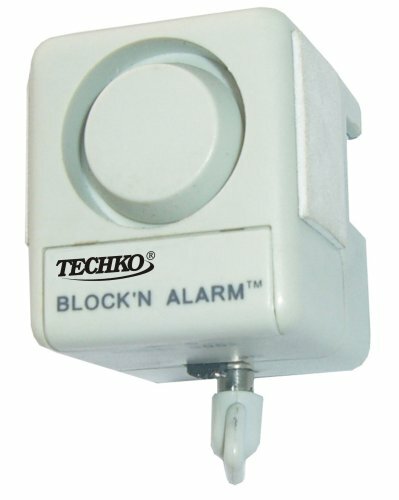 Dimensions: 4" L x 0.75" H x 1.5" H.
Techko's S090 Magnetic Sensor Entry Alarm is solar powered and can provide valuable protection for your home or property by detecting the unauthorized opening of a door or window in a low-profile design. This alarm is designed for use on window or glass doors facing the sun (best with non-tinted glass). When the door or window is opened the alarm's switch detector sounds the built-in 90 db alarm immediately. The S090 and magnet adhere with double sided tape (included). To arm or disarm the system there is a convenient slide switch on the side of the unit. Built-in 90 db alarm with high/low adjustment. For use on window or glass doors facing the sun. Low battery LED indicator. Used on non-tinted transparent windows sliding non-tinted transparent doors facing sunlight. High output alarm. No tool installation. Ultra thin design. Simple On/Off switch operation. Rechargeable ni-mh battery operation (included). 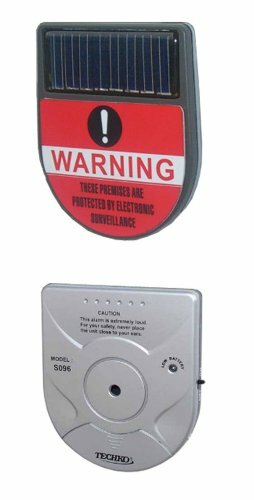 Dimensions: 2.25" L x 0.375" H x 2.75" H.
Magnetic sensor entry alarm. Excellent for windows sliding doors and cabinet protection. High output alarm. On/Off switch operation. No tool installation. Excellent for travelers. Button cellbattery operation (included). Dimensions: 2.5" L x 1" H x 1.5" H.
Sold as each. Instant alarm. 30 sec. alarm cycle. Operates on 2 "AG13" batteries. 3 year warranty. Clamshell. Manufacturer number: S086C. SKU #: 5039979. Country of origin: China. Distributed by . 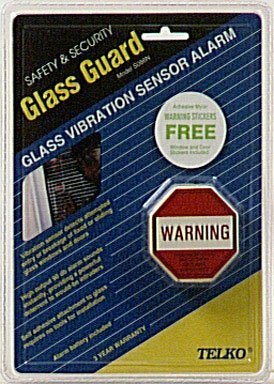 Techko's S086X Glass Vibration Breakage Sensor Entry Alarm with Ultra Slim Design can provide valuable protection for your home or property by detecting glass vibration or breakage of a window in a low-profile design. When a protected window is broken or excess force is applied the alarm sounds its built-in 90 db alarm. After 60 seconds the alarm will reset itself. The S086X adheres to any glass surface. Simply remove the adhesive film covering the warning sign on front of the unit and apply to the glass. To arm or disarm the system there is a convenient slide switch on the side of the unit. Vibration sensor activation. No tool installation. Ultra slim profile (1/4" 7mm). Use for windows sliding doors and cabinet protection. High output alarm. Simple On/Off switch operation. Button cell battery operation (included). Low battery indicator. Dimensions: 3.125" L x 0.25" H x 2" H.
Sold as each. Works when door is closed or partially opened. Vibration activated. Screw locking. 120 DB alarm. 12V battery included. Clamshell. Manufacturer number: S062. SKU #: 5063722. Country of origin: China. Distributed by . 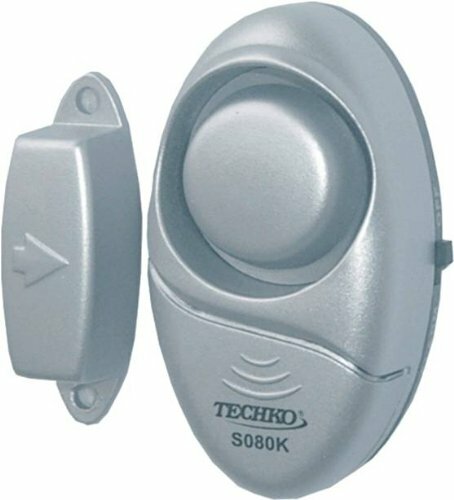 Techko's S090 Magnetic Sensor Entry Alarm is solar powered and can provide valuable protection for your home or property by detecting the unauthorized opening of a door or window, in a low-profile design. 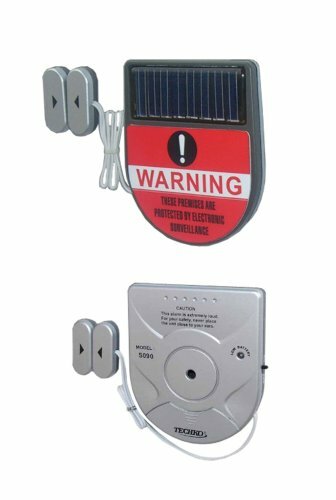 This alarm is designed for use on window or glass doors facing the sun (best with non-tinted glass). When the door or window is opened, the alarm's switch detector sounds the built-in 90 db alarm immediately. The S090 and magnet adhere with double sided tape (included). To arm or disarm the system, there is a convenient slide switch on the side of the unit. The S080K alarm is a portable, easy to install alarm that helps bring peace of mind both at home and away. with no tools needed for installation and an alarm that sounds at 90-105 dB, you can easily protect your home from unauthorized entry.